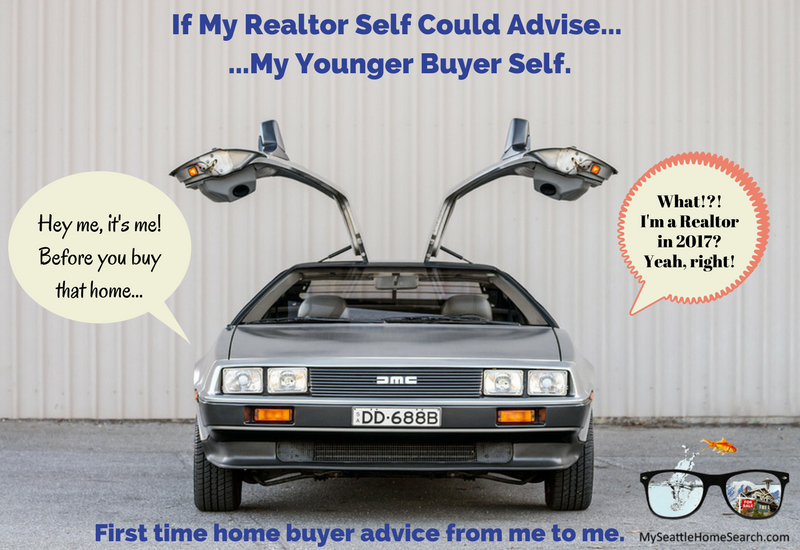 First time home buyer advice to myself from my future Realtor-self. Younger buyer me: "What?!? I'm a Realtor in the future???" Time travel Realtor me: "Yup, and you will love it!" Younger buyer me: "But, I was going to cure cancer, win the Nobel Prize and have Neil deGrasse Tyson over for dinner. Time travel Realtor me: "Um, well, we'll get back to that a little later. Right now, however, I've come back from the future to help you avoid making some mistakes on that home you're about to buy". Younger buyer me: "OK, I'm listening". Time travel Realtor Me: "now that I'm a Realtor myself, I can now see that your agent will turn out to be underwhelming. You will feel like he is just going through the motions and more focused on the sale than you. He will show you one of his own listings which means he isn't adverse to dual agency. Plus there will be other actions that adversely affect your home purchase. You should get another agent!" Now that I’m a Realtor I think dual agency should be banned. It’s basically where the listing agent represents both the buyer and the seller in the same transaction. It’s a complete conflict of interest. When it came to making the offer on the home, he provided little advice on structuring the offer. Considering the home had been on the market for 5 weeks and the owners needed to sell, I felt like he did not leverage that to get a better price. Was not a good negotiator. I met my Realtor through a 3 evening buyer class. I wanted to accumulate as much first time home buyer tips and advice as possible. His sidekick was a mortgage broker. Kudos to me for taking those classes and learning the basics of buying a home. However, I could have done better in whom I chose to actually help me buy and finance my home. He didn't recommend that I do a certain type of inspection that subsequently cost me a chunk of money after I moved into the home. See below for the fun details. The other reason I wasn’t too impressed with my real estate agent is that the mortgage broker he teamed up with was just plain bad and incompetent (see below). If my agent was OK with teaming with THAT idiot mortgage broker, then what does that say about him? The Realtor you choose is critical to ensuring a smooth transaction. No home purchase is completely smooth and some issues will always pop up. However, you want an agent who has YOUR best interests at heart. Ask your friends and co-workers for recommendations. "Your agent will fail to recommend a critical inspection item and That’s going to come back and bite you!" My sewer line was backing up! The toilets were being flushed at a rate the home probably hadn’t seen in 20 years. Yes, I grabbed the yellow pages (remember, it’s 2003) and called the ad on the back….never a wise move. $300 later, they had unblocked the sewer line. I made myself an extra stiff gin and tonic and rejoined the party. There are certain things to inspect when buying a home and "I/we" had missed a major one. The following week, I called a real plumbing company and was informed that the original 1931 segmented clay pipeline was collapsing with lots of root intrusions. The NW has a lot of BIG trees! $15,000 later, I had a new sewer line. Just what a new homeowner wants to pay for a few months after closing. As fabulous as a new sewer line is, nobody can see it. It's not like I'm going to invite friends over to see it. I could have installed a new bathroom for the same price! Younger buyer me: "Now you tell me!" "Your stress level is going to hit the roof!" Time Travel Realtor me: "make sure your agent calls the listing agent BEFORE submitting your offer. You want to find out when the sellers will be able to respond to the offer. 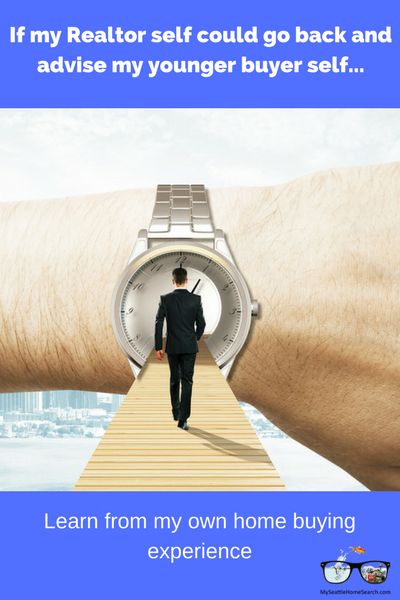 You don't want to give them too much time to leverage your offer to try and get a better offer. I can see that they will be leaving for the weekend with no phone service. Wait until Monday to submit your offer". Even though I considered myself a well-prepared buyer and had a decent grasp of the nuts and bolts of the how to buy a home, nothing could prepare me for how stressful the whole process would be. When buying a home, some things are out of your control. The home I bought had been sitting on the market for 5 weeks and I thought the sellers would jump on my offer the minute I submitted it. Unfortunately, I made my offer on a Friday but the sellers had left for the Cascade Mountains for the weekend. Even today, cell phones don't work there. Probably the whole point for heading tothe mountains! I would have to wait until Monday for a response. THREE WHOLE DAYS!!! Even worse, the listing agent held an open house that Sunday, no doubt telling potential buyers they had an offer (MY OFFER!) but could do with a better one. What are those people doing in MY HOME! My cortisol levels were 2 standard deviations above normal (once a science geek, always a science geek). All that WAITING and WAITING! The other major stressor was my incompetent and non-responsive mortgage broker. See below for more details. Always chasing and waiting for answers. No matter how well you are prepared, Mr. Stress will make an appearance at some stage. There’s lots of waiting periods when buying a home and you need to try and stay sane during those long waits. Accepting there will be "challenges" along the way will help you prepare for what lies ahead. However, having a good Realtor/mortgage broker team will help eliminate many of the things that can send you into insanity mode. "Your mortgage broker will be terrible. Use a different one". Time Travel Realtor me: "trust me, you’re like most buyers. You’re pickier as to the real estate agent you choose but you spent little time selecting your mortgage broker. Or if you do, you do it mainly based on the interest rates they are quoting you. Plus, you are slightly confused by the complexities of the whole mortgage process. Don’t use the mortgage broker your agent teams up with because that broker is an idiot and will jeopardize the sale. Do some research and get yourself a better lender”. My mortgage broker was one half of the team hosting the 3 evening first time home buyer class I took. He was charming and responsive when getting my loan pre-approval and up to the day he submitted my mortgage application. And then…. the service went south, fast! Emails and phone calls would go unanswered. His assistant would assure me that he that he would get back to me as soon as possible. He quoted me an interest rate that he couldn’t honor. I ended up with a higher interest rate which I learned about 3 days before closing. I hated dealing with him. I threatened to report him to the Better Business Bureau and only that got his attention. His incompetence and lack of common professional courtesy spoiled the sale for me. The fact that my real estate agent was willing to team up with him didn’t exactly reflect too well on him. So, you ask, why didn’t I just dump him and go with a different mortgage broker? Well, once you have an offer accepted by the seller, you have about 3 days to lock down your lender. After that, you are stuck with that mortgage broker/lender all the way to closing. My guy went AWOL after that 3 day period. Your lender is as important as your agent. Having a great Realtor/lender team will make life a lot easier for you. A bad lender can really screw things up for what is probably the largest purchase you will ever make. Spend equal time finding a good Realtor and a good lender and decide whether you should go with a mortgage broker or a bank. Meet with them in person and don’t focus solely on the interest they quote you. Choose wisely. "Your inspector will be top notch. Call him when you become a Realtor." Time travel Realtor says: "your inspector knows what he’s doing. You can trust him. Just you watch. All those things that he says will need taking care of, be it immediately, in 3 years or 10 years, will come to pass". Although my Realtor was underwhelming and my mortgage broker was incompetent, my property inspector was excellent. He picked up on all the major items while not scaremongering on the smaller items. A good home inspector is critical to protecting you from buying a lemon. Some lemons are obvious to anyone but some are a lot more subtle and can only be exposed by an experienced and trained set of eyes. When buying a home, don’t sweat the small stuff and annoy the sellers by nit-picking minor blemishes and repairs. But most definitely focus on the big-ticket items. And did I call him when I became a Realtor? Absolutely, he was the first one I added to my list of trusted home inspectors that I recommend to my clients. don’t tell anyone, but the market is going to crash in 4 years time, but your home will still be a good long-term investment. Future Realtor says: “I probably shouldn’t tell you this, but 4 years from now, all the current irrational exuberance of easy lending is going to come back to haunt us. It will be known as the great recession and it’s going to be ugly. But since you are intending to stay in the home long term, don’t worry about it and just keep making those mortgage payments”. Home buyers and sellers are always asking “what’s the market going to do over the next couple years or so. The answer is that nobody knows. Purchasing a home when home prices are accelerating upwards quickly can be a scary prospect. Buyers will be wary that they are buying at the top of the market. Looking back now, its all seems so obvious that the market would have a significant “readjustment” at some stage and that home prices could not continue at that upward pace. All the dodgy lending practices, those unintelligible mortgage backed securities and corrupt banking practices were all bound to be exposed eventually. Obviously, prices didn’t just “readjust”, they crashed and dragged the whole economy down with them too. When the bubble popped in 2008, Seattle home prices fell by about 28%. However, today (December 2017), prices are 56% above the previous highs of 2007. Who would have predicted that? Although lending practices are allegedly a lot more stringent now compared to the early 2000’s, nobody knows if we will implode again or do a slight readjustment at some stage. If you look at your home as first and foremost A HOME and not as an investment and hold it long term, then who cares what the market does. It should go up over time (but don’t quote me on that). Holding a home for the shorter term can have some financial risks. Time travel Realtor me: "once you become a Realtor, mum will be in complete denial and continue to tell the neighbors that you are a very important scientist over in America (Irish mothers really like to try and out-boast each other). Will be 2014 before she finally admits that you're (1) a Realtor and (2) are not starving to death". Younger buyer me: "just what I would have expected. So, do I cure cancer or not?" Time travel Realtor me: umm...no but you do get to work with a lot of great people. You generously left the glory to somebody else". Younger buyer me: "you're such a sweet talker! But hey, before you go, who's the President in 2017?" Time travel Realtor me: "I don't want to spoil the surprise for you. You're just going to have to wait and see! Besides, you wouldn't believe me if you told you anyway." Some final thoughts on First Time Homebuyer Advice From Me To Me. Foresight is a great thing and it's easy for me to now look back and see how I could have done some things differently when I bought my own Seattle home before I became a Realtor. Almost all home purchases will have some bumps along the road. However, the better you are prepared before you start looking for a home and making sure you have a great Realtor and lender on your team will go a long way towards a successful home buying process. And in my case, it all worked out OK in the end. And no, for the record, I have never owned a pocket protector! Here are some great additional articles on first time home buyer tips and advice. What You Wish You Had Known Before Buying a Home from Lynn Pineda. First Time Home Buyers Tips And Advice That Must Be Read from Kyle Hiscock. Important Questions Buyers Should Ask Their Agent from Wendy Weir. First Time Home Buyer Process from Eileen Anderson. What to Consider When Buying An Older Home from Paul Sian. The above article "If My Realtor Self Could Advise My Younger Buyer Self" was written by Conor MacEvilly. Conor is a Realtor living in the Ballard neighborhood of Seattle. He works with both home buyers and sellers in the greater Seattle real estate market and on and on the Eastside in neighborhoods like Redmond, Bellevue and Kirkland.